Ian Bonser, who has helped countless people to follow their golfing dreams, was honoured last night with England Golf’s Lifetime Service Award, sponsored by The Telegraph. 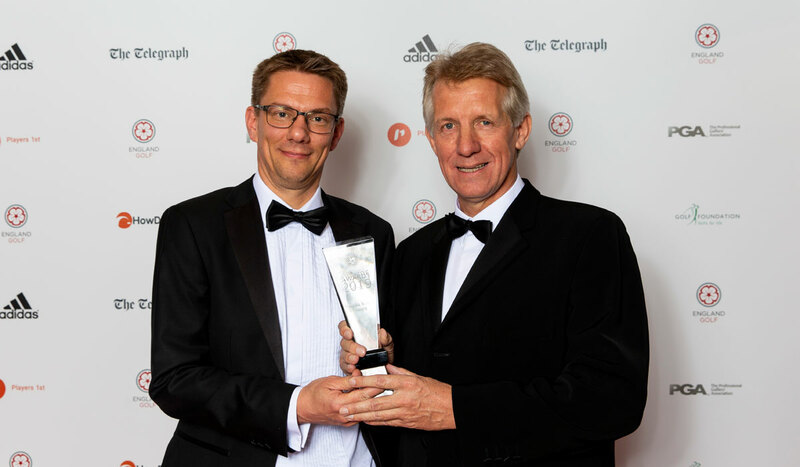 Bonser, the owner of the 3 Hammers golf complex in Staffordshire and a committed volunteer in the game, was recognised at the England Golf Awards, sponsored by adidas Golf, at the Royal Lancaster London. Hundreds of guests from across the sport applauded his contribution to golf over the last 32 years – which he insists is by no means over. Over 32 years his ambition has touched countless people. Each year, over 200,000 people visit the centre. In the last four years 30,000 adults and 10,000 juniors have had lessons at 3 Hammers. Thousands of pupils in 12 schools are introduced to the sport. 3 Hammers has won awards, has started European Tour players on their journey, and has supplied local golf clubs with a steady stream of keen, new members. But, as well as investing over £1m to create a state of the art centre, Bonser has also given freely of his own time to help grow the game. He acts as a consultant to several local golf clubs, helping develop memberships and secure a brighter future for golf. He had also advised the UK Golf Club Owners Association, the government and the Treasury on issues facing the industry. And he’s always looking for ways to reach out to the community. So, in June, 3 Hammers will fund prostate cancer tests for up to 1000 local men. Previously Ian’s team has worked with the Wolverhampton Community Trust on a diabetes project and a scheme to help young offenders to use golf to transition back into society. Another project helps young people from disadvantaged backgrounds to build their confidence. Bonser (pictured right) received his award from Adam Sills, Head of Sport at The Telegraph.